Artist's rendering of the solid state airplane. (Inside Science) -- Scientists have created the first airplane that can propel itself without moving parts. Instead, it electrifies air molecules and rides the resulting "ionic wind." Although the new aircraft has a long way to go before it ever has a chance of flying as well as conventional airplanes, the technology could one day still find use in silent stealth aircraft and miniature drones, researchers said. Since the Wright brothers' pioneering flight more than 100 years ago, virtually every plane in the sky has flown with the help of moving parts such as propellers and turbine blades. However, for decades, scientists have suggested that airplanes could theoretically fly without moving parts, using a solid-state mode of propulsion called electroaerodynamic thrust. "I was always a fan of Star Trek as a kid, and I was thinking of how airplanes should be in the future," said study senior author Steven Barrett, an aerospace engineer at the Massachusetts Institute of Technology. "I didn't think they should have propellers or turbines, and should silently glide with some kind of electromagnetic propulsion like in Star Trek. The only known physics I could find that might make this possible was electroaerodynamics." An electroaerodynamic aircraft works by sending current through an electrode dubbed the emitter. This energizes the surrounding air and the electrically charged air molecules are then attracted toward another electrode on the aircraft called the collector, generating a propulsive ionic wind. "The effect has been known about since the 1920s, but until recently the physics of electroaerodynamic propulsion were not understood well enough to produce a viable airplane," Barrett said. Until now, electroaerodynamic aircraft were mostly just small desktop "lifters" that could hover briefly in the air. 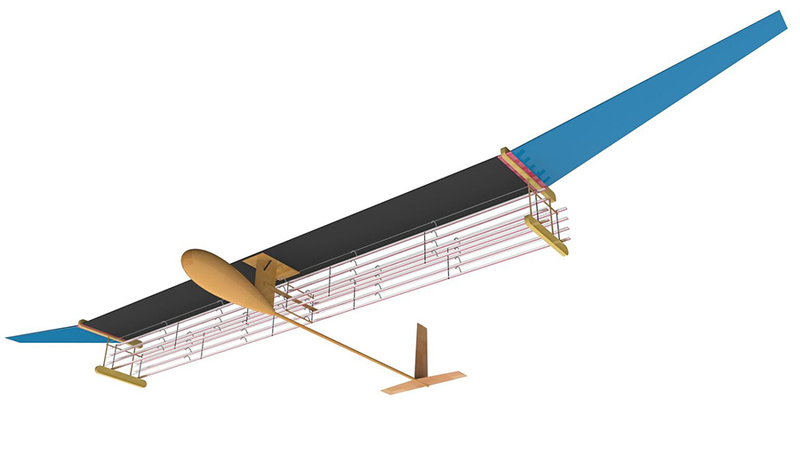 After nine years of work, Barrett and his colleagues have now developed the first electroaerodynamic airplane to generate enough ionic wind for sustained flight. "It was thought impossible that this would work," Barrett said. The new aircraft is about 2 meters long and has about a 5-meter wingspan. The researchers chose a relatively small wingspan to lower weight and thus the amount of power needed to fly it. The wings are made from carbon fiber, balsa wood, extruded polystyrene, and shrinkwrap plastic, while the airframe is made from carbon fiber, Kevlar and extruded polystyrene. "This was all designed to make the plane as light as possible," Barrett said. All in all, the airplane's weight is only 2.45 kilograms, nearly half of which is taken up by the batteries and other electronics it needs to fly. The fuselage of the airplane holds lithium-polymer batteries. These charge the thin positively charged wires strung like fencing along and beneath the front edge of the plane's wing that serve as the emitter electrodes. Thicker negatively charged wires run along and beneath the back edge of the wing and serve as the collector electrodes. In test flights, operators remote-controlled the airplane via radio. The scientists used bungee cords to launch the airplane, while ionic wind powered the rest of each flight. Not all flights went perfectly. Sometimes the airplane crashed into the wall; other times "we crashed it into the floor of the gym we used as a test arena and it started zapping the floor with 40,000 volts," Barrett said. Still, the scientists proved the aircraft could repeatedly fly roughly 55 meters per flight, reaching a velocity of about 17.3 km/hr. "These results are a big step because no one before has ever flown anything heavier than a few grams with ionic wind," said fluid mechanics researcher Franck Plouraboué at Toulouse University in France, who did not take part in this research. Currently the new aircraft is only about 2.5 percent efficient at converting its stored energy into thrust, compared to the nearly 50 percent efficiencies seen with highly optimized airplanes with conventional propulsion. "This is in part because we didn't optimize the design for efficiency, but for smallest size and technical risk," Barrett said. For their second prototype, the researchers are aiming for up to 15 percent efficiency by producing more ionic wind with less voltage, he added. The scientists noted electroaerodynamic aircraft are potentially quieter and mechanically simpler than conventional aircraft, and do not emit environmentally harmful combustion emissions. The fact they lack moving parts also could permit miniaturization to an extent not possible with conventional propulsion, they added. Still, research needs to create more efficient aircraft that can fly longer and outside before they can perform useful missions, Barrett said. Although the airplane requires no moving parts for propulsion, it still needs moving parts such as rudders for steering. The scientists hope to eliminate these components as well in the future "and control the aircraft by shaping the electric fields," Barrett said. They would also like to replace the hanging electrodes with ones integrated with the airframe "so the skin of the aircraft becomes the thrust generator," Barrett said. All in all, the researchers noted their prototype compared favorably to the first Wright brothers' flights. "We've got lots of ideas for future development of the technology and things to try out," Barrett added. The scientists detailed their findings in the Nov. 22 issue of the journal Nature.